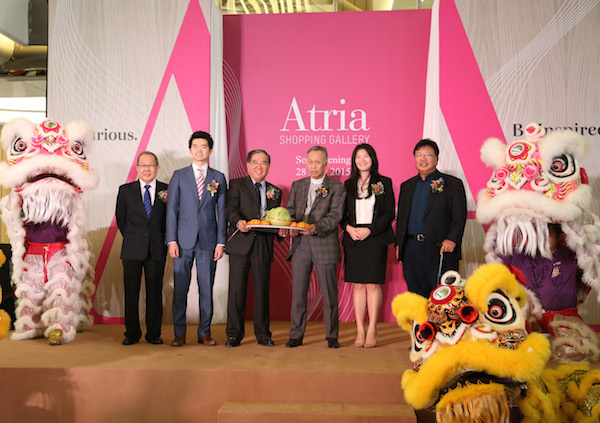 The pride of Damansara Jaya – OSK Property has revealed the highly anticipated re-birth of Atria Shopping Gallery today. Inspired by the beauty of nature, this award-winning shopping gallery has taken the old icon a step forward, reviving its legacy – brought to live with a contemporary atmosphere of natural abundance. Ever since its launch back in the 1980s, Atria has remained an iconic neighbourhood shopping mall. Speak to the long-term residents of Damansara Jaya, and they will regale you with tales of tea dances and underground gigs back in the 80s. The then popular stores were Printempts of France and Kimisawa of Japan which was later, taken over by Parkson Grand and then, Atria Shopping Centre was born. The shopping centre lost its shine in the mid-2000s as it was run down and there were no rooms to compete with the larger shopping malls around PJ. In 2007, OSK Property decided to acquire and restore the mall into its former glory, in relevance to Malaysia’s vibrant and fast-changing lifestyle. Today, the doors of Atria Shopping Gallery are open. Awarded as the Best Retail Interior in Asia Pacific Property Awards 2015, Atria Shopping Gallery has been revived with a sense of natural opulence within a contemporary retail scene inspired by the unique rainforests in Malaysia. From its concept to composition, the organic feel of space is achieved through clean bold lines and a sensitive use of nature-inspired materials. The diverse forms of the rainforest are simplified into visually pleasing geometries and motifs derived infuse the mall with a rich, exotic ambience. “Atria Shopping Gallery is the first and flagship mall of OSK Property. It is our pride and joy to bring back this iconic and nostalgic landmark back to its fame and glory. Much precision and details have been put into consideration of its interior design bringing a whole new experience to shoppers and visitors. We hope that the shoppers will enjoy the one-of-its-kind concept, modern architecture, stunning interior design with an exciting tenant mix to cater to the modern lifestyle,” said Sally Low, Leasing Director of OSK Property Holdings Berhad. Spanning across the 5.5acre of freehold land, this neighbourhood mall is packed with a myriad selection of tenants for today’s sophisticated and discerning tastes. Much effort has been invested to ensure a quality tenant mix, from upmarket fashion and a sumptuous spread of dining options to a comprehensive line of retailers that caters to each lifestyle needs. The famous Spanish fashion outlet, MANGO features its largest and most impressive outlet in the country yet, with an expansive 16,000sqft retail experience bearing all MANGO’s lines. Similarly, outlets such as Village Grocer, CHI Fitness and Hamleys – the world renowned toy store are here to serve as Atria’s anchors. A mixture of international and local F&B will definitely entice shoppers and diners alike. Bringing in new experiences, regulars like Absolute Thai introduces its first dessert bar for a sweet surprise in a chic new setting. Sushi connoisseurs will exult as Kame Sushi make its way to the mall serving some of the freshest and most authentic omakase Japanese cuisine in town whereby its seafood are flown in all the way from Kyushu. Meanwhile, visitors will also be introduced to many pioneer outlets in Malaysia including Pizzolo, Pho Vietz and Tokyo Ramen which has chosen Atria as their first home in Kuala Lumpur. Manmaru, known for its finest udon is now bringing its full-fledged exquisite Japanese cuisine under the trademark concept of Robatayaki & Bar for the first time. And the internationally renowned restaurant, Antipodeon will introduce its first water-featured café and a special designed dinner menu which can only be found at Atria Shopping Gallery. Also a first will be The Little Tree House – a joint collaboration between OSK Ventures Investment and HELP Education Berhad in providing a holistic and enriching learning experience for children age 4-6 in a highly effective teaching team that provides a blend of British and Malaysian Preschool Curriculum. That aside, the biggest Jungle Gym is here in town for children to have lots of fun – featuring a party room and party shops where kids can hold their birthdays and special occasions with their schoolmate, friends and family. Atria Shopping Gallery boasts a net lettable area of 470,000sq.ft. and a total of 392 units for its upcoming Small offices, Flexible offices (SoFo) development which is due for completion in Q4, 2015. Customers will be able to enjoy retail experience in a comfortable and convenient environment as there will be five drop-off and pick-up points area surrounding the mall. Meanwhile, measures have been taken to improve the traffic flow upon the opening of Atria with 1,700 secured parking bays and valet parking available for visitors. Atria Shopping Gallery will be targeting 30,000 visitors per day on the weekends and 15,000 visitors for weekdays. In celebration of the re-birth of the shopping gallery, there will be activities and promotions this coming weekend including Zumba performances by CHI Fitness and performance by Suki Low. Roar in style this school holiday with activities we have for parents and children. There will be art and craft as well as face painting workshop to keep your children busy. 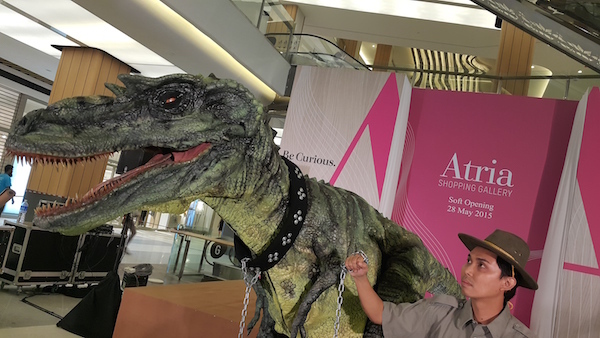 Bringing you an all-rounder experience of nature, the dinosaurs will also be making a comeback, roaming around the shopping mall and making its breeding ground – a sight not to be missed! Special discounts, promotions, buy 1 free 1 offers will be available in selected tenants from 28 May – 30 June 2015. Shoppers will also receive a complimentary Atria designer tote bag with a minimum purchase of RM350 (a maximum of 2 receipts).